I know I said I was going to show you what I got today, but I want to do a nice photo story, so instead I am going to rant talk about the new girl of the year, Gabriela McBride. First of all, Gabriela is not a real girl of the year. The website, the catalog, and even her box say ‘Available through 2017 and beyond’. This means that she is a modern character, but not a real girl of the year. So why are they advertising her as a girl of the year if she’s not? Is she going to be the last doll released on January 1? Are they going to turn her into a modern character at the end of the year and release a new girl? She’s also not unique. I’ve seen people say that she looks like 56, and American Girl said so by offering a free meet outfit to anyone who has 56. 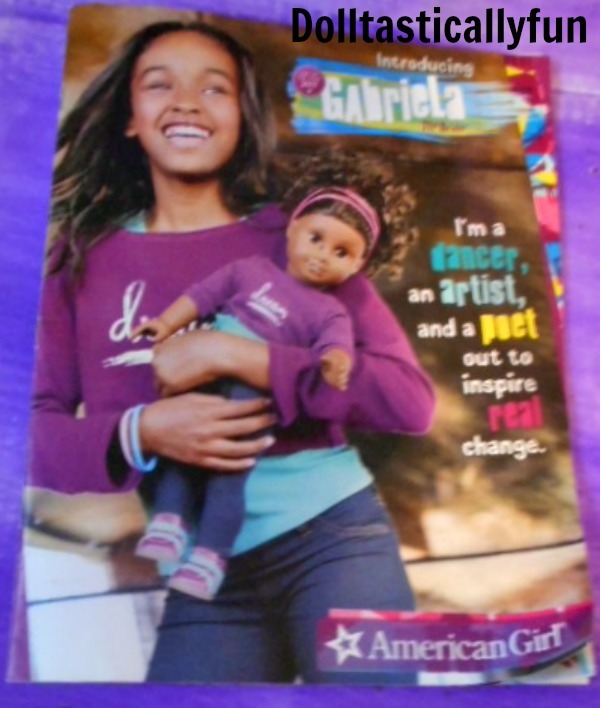 I think they could have made a lot more money by making Gabriela a little different. She could have had longer hair, a different part, and a different color of eyes, maybe amber, instead of just being a Truly Me doll with a story. If she is the last girl of the year that might explain why she is black, but really. Come on American Girl! You should offer black dolls even if they aren’t going to be the last girl of the year. And releasing her right after Melody is kind of strange. Gabriela’s collection is quite small. I’m glad her ‘big’ item isn’t expensive, but it’s the only furniture item she has. Lea had a kayak, fruit stand, and rain forest hut. The dance ‘studio’ isn’t expensive, but really, it’s not unique. If you have Isabelle’s dance bar, which is the same as Gabriela’s you could easily make a background to put in your scene. It’s nothing like Lea’s rain forest house which can be recreated, but nowhere as easily as Gabriela’s studio. I wish they had done something amazing this year. Her outfits are kind of strange. Her meet outfit is okay, but it could have been done better, with stitching on the jeans, and maybe another accessory. She has no skirts or dresses in her collection, which is really weird. I can’t recall any doll not having any skirts or dresses. And her practice outfit is really strange. It would be good for mix and match, but I have never seen anyone wear anything like that, and if I owned that outfit my dolls would never wear the entire outfit at the same time. The tap shoes are really cool, but way overpriced, and the taps are plastic! Real tap shoes are only about twice as expensive, and they have real taps. In my drama group we do some tapping, and while at least twenty people have tap shoes, none of the shoes look like that. I just don’t think it’s worth it. In fact almost nothing from her collection I really like. Maybe there will be good stuff for the summer release, but the way American Girl seems to be going I would not be surprised if there wasn’t.